Jason and his brother-in-law were in a car accident while they were working out of town in Texas. He is in critical condition and has a long road ahead. He is fighting like we all know Jason can. His mom, dad, Brittany, and Bethany are there with him. Christopher, Jessica, Candice and his grandmother Diane are at home in Greenhill taking care of the children. 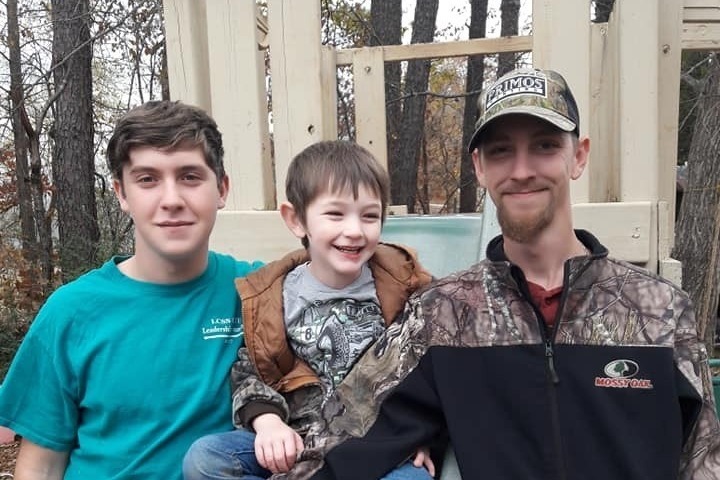 I'm his brother-in-law and I set this page up to raise money for Jason and his family during this time. He will have a lot of expenses as a result of this. Anything raised will go to his mother Melissa and anything will be appreciated greatly. Please continue to pray for Jason and his whole family. Pray for his sons (who are pictured with him in the picture here). I will update this page with information as it becomes available. Thank you everyone! Jason is out of surgery. It went well. They placed a trach and feeding tube and done most of the facial repairs. Thanks to all who have been praying for him. Today has been a good day. Nothing big going on. Jason seemed to interact with me more like when I would tell him something he would sometimes give me a thumbs up sign. Like he was saying ok. He was pretty active this morning then mostly rested this evening. We have a big day tomorrow. He will be have surgery to reconstruct his face. They will also place a trach and most likely a feeding tube. Everyone says lots of prayers for every one involved in his care and for him. And guys say an extra prayer for Hank's family and Bethany as they have a long week ahead of them. Love you all and thanks for everything. We have had a busy day. Jason's surgery went well. They repaired the area where the fluid was leaking. They decided not to replace the bone at this time, so they stitched and stapled it closed without any metal plate or bone. They will replace the bone with a custom made one in about 6 weeks. They are talking about surgery on the face next week but that could change. When they repair the facial bones his jaw will have to be wired shut for approximately 6 weeks. They will most likely have to put in a trach and feeding to be for a while. At this time they are still waiting to see if they will have to repair the cervical damage. And we will not know the extent of any lasting brain damage until he is off sedation and alert. If there is one thing I have already learned here it is plans change quickly. So when I update and tell you guys something different it's because the game plan changed. They have told us that Jason's body will dictate what is done and nothing will be done until his body is ready. Sorry about the long post but I just want you guys to know what's going on. Also, I will never be able to express the gratitude my family feels by all the concern everyone has shown. Thank you so much. From the beginning, he and Hank were involved in a head on crash around 4:30 Monday afternoon. They were taken to a local hospital and then air lifted to Amarillo. Jason was then taken to Lubbock where he is now. He had surgery on his abdomen in the early hours of Tuesday morning. They repaired a laceration to his liver. He had another surgery Tuesday afternoon. They installed a rod in his femur. They gave him a day of rest on Wednesday. He was scheduled to have surgery today, Thursday, but they want to wait about the neck surgery to give his body a chance to heal itself. They plan to go ahead with surgery tomorrow to repair the brain covering to stop the fluid leaking. As of right now, they are hoping to do facial reconstruction surgery on Tuesday. They said plans can change rapidly, as they have many times already. They will let his body dictate what to do and when. Please continue the well wishes for Jason. He has a long road to recovery and will need the support, prayers, and well wishes from everyone. The family would like to say thank you to everyone who has donated and prayed for Jason. It is very much appreciated.